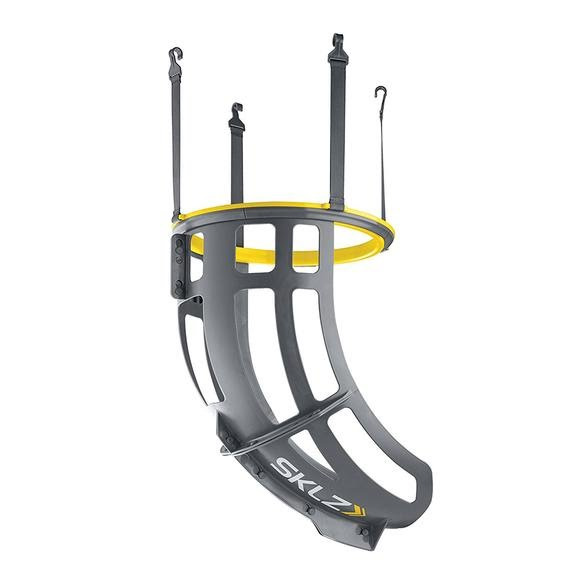 With Sklz's Kick-Out, made shots come right back. This 360° ball return system clips directly onto the hoop and feeds made shots anywhere on the court. Pure shooting is making its return with the Kick-Out. Featuring a 360-degree chute that returns made shots anywhere on the court, the Kick-Out clips directly onto the hoop quickly and easily. With Sklz &apos;s Kick-Out, made shots come right back. This 360° ball return system clips directly onto the hoop and feeds made shots anywhere on the court. Pure shooting is making its return with the Kick-Out. Featuring a 360-degree chute that returns made shots anywhere on the court, the Kick-Out clips directly onto the hoop quickly and easily. It&apos;s the ultimate make-it and take-it ball return for building better shooters.